Capitol Hill’s summer plans are starting to solidify — they involve a lot of digging and big cranes. 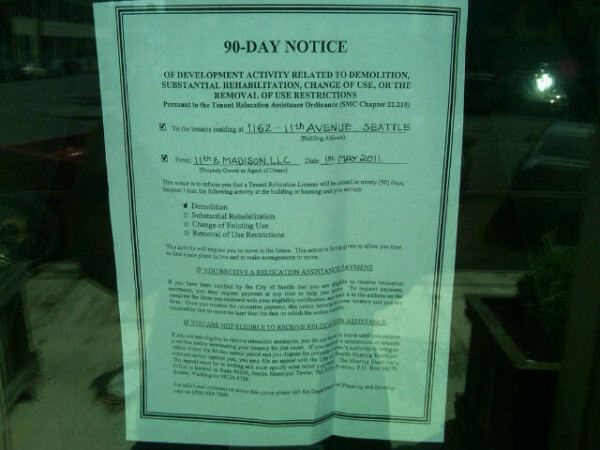 An apartment dweller of the faded and fabled Undre Arms has posted a picture of the 90-day notice remaining residents have received. Come August, it will be time to start tearing down the building and others on the lot including the homes of the Cobra Lounge and Thai Curry Simple. 11 of the Undre Arms’ 14 apartment units are currently inhabited according to filings with the city. Land Use Application to allow a 6-story, 105 unit apartment building above 8,116 sq. ft. of ground level retail. Two levels of below grade parking for 77 vehicles to be provided. Review includes demolition of three existing structures (totaling 8,573 sq. ft.) and 16,300 cu. yds. of grading. Demolition & grading all done under separates permits, per plans. Monday, we reported on another project designed by Runberg Architecture Group being planned for Bellevue Ave E and described as a “workhorse” workforce project for affordable housing. We reported in March that the 1111 E Union project was picking up steam and would soon be displacing existing tenants of the lot. The development’s revival began back in August as Union and Madison, LLC started planning for the change to apartments from condos and to move forward with the near-$13 million construction budget for the project. Undre Arms II would be a cool name for the project! Businesses on the lot that moved to their spaces in the meantime are subject to demolition clauses and have been prepared for the coming day when they’ll need a new home. Erin Cobb of the Cobra Lounge told us in March he hopes to move his lounge to a new Hill home. The start of work in the triangular lot along Madison will add even more construction activity to the Hill this summer. We recently reported on eight projects currently underway on Capitol Hill and First Hill. Now there’s nine. Demolition has already occurred for the Bellevue Terrace project. Its neighboring Pine Street Apartments project hasn’t yet forced the demolition of the crumbling Marion Apartments. The developer told us a groundbreaking date is pending the project’s ability to secure a construction loan but we don’t have information on whether a demolition in the meantime is imminent. Joining this busy environment will be demolition work at 11th and Pine on the Sun Electric building apartments and retail. Developers on that project had been hoping for a summer start. Things are also moving forward for the Cascadia Center development at 15th and Madison following the project’s victory over an appeal against its permits. The Bullitt Foundation is holding a free, public event at Benaroya Hall on Wednesday night to showcase the Center’s green goals of net-zero waste. No construction permits have been issued — there are still some additional discussions that need to happen with the City regarding the project’s planned photovoltaic arrays. The end of summer might add yet one more construction project to our midst. Planning for the streetcar line that will connect Pioneer Square to First Hill and Broadway is progressing. CHS attended a briefing at last month’s Capitol Hill Community Council meeting where the City’s latest plans for the line were presented. Part of that is talk of work beginning on the line later this year as the project pushes for an operational date in 2013. We’ll have more soon on the briefing. In the meantime, the Seattle Design Commission will discuss the line at its next meeting this Thursday. The summer construction schedule is so thick that even Capitol Hill’s central park is in the mix. Cal Anderson’s Bobby Morris playfield is slated to have its lighting replaced in a multi-month project beginning this June. Build the city! Every unit built here is a person not living out in the ‘burbs. I am so sorry to see this little triangle disappear into yet another bland blah project. I’ve either lived by or regularly walked by the Undre Arms for most of my time in Seattle and it’s got great personality. I also miss the Color Store. Oh well, that’s progress. As I have argued before, not all old buildings are worth saving. I think the under arms, with what appears to be massive structural problems and lackluster design from the get go, is not among the most precious of old buildings on Cap Hill. This site deserved an iconic triangular building. The real story here is that runberg is no longer the architect in this deal – new guys from olympia have been brought in. I hope someone is tracking the design to make sure it sticks to what was required in initial review with the nhood. The term to describe this project is not “workhorse” housing but “workforce” housing – housing that is relatively affordable to working households. Rent is typically not heavily subsidized, if at all – with a pricepoint for rent that is reasonable for the lower to moderate incomes of a wide range of employees – from teachers to firefighters to restaurant employees, etc – the folks who work in the community who can walk or bike or take transit to their jobs and who should not have to drive long distances to housing affordability. This type of housing is an important addition to the community in which many of the new projects are at the higher end of the rent scale. I actually agree with you – the Undre Arms structure itself is a mess and not worth saving. But it’s been such a weird little island in Cap Hill, I still hate to see it go. Thanks for the note. I think this shoots to the top of our all-time screw-up list. Tom’s report on the new project used the term “workhorse” — his editor (me) should have caught it and realized the word shoudl have been “workforce.” His editor (me) should have realized the error (again) when I repeated this morning. Changing all around. Sorry for the dumb mistake(s). Kind of sad to finally see it go. That’s progress. 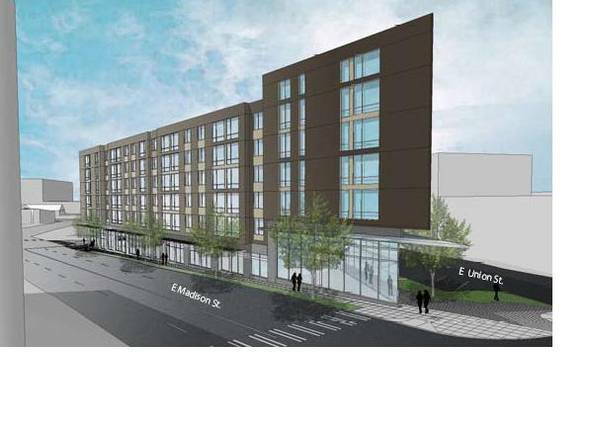 Oh come on… This “little triangle” is mostly an ugly surface parking lot lot and a ramshackle apartment that disconnects pike/pine from SU. I miss the colour store too, but I’m happy that Pacific Supply stepped up its paint section. the population of seattle is supposed to grow by 200,000 additional people over the next 30 years. the real-estate investors realize that these buildings are long-term great investments. unfortunately for us, awesome places like the cobra lounge probably can’t afford to run their business in the high-rent commercial that will be on the bottom level of these apartments. we may as well become accustomed to the changes, as much as we’d like to resist. all we can do is enforce codes that try to maintain some modicum of uniqueness to the area. judging by the new buildings we’ve seen so far, we’re not doing a very good job of that. pretty sure I’ve seen/heard the term “workhorse” used to describe developments though too… meaning it’s not a glamorous project but it serves a purpose. It made sense to me in context. Pacific Supply has definitely increased its paint selection – and their customer service is fab! – but I wish they’d get better paint brushes/rollers. The ones I’ve gotten there are terrible. I think we need to dispel the myth of firefighters being in the same socio-economic class as the average American. Please note, I am not saying they don’t deserve the wages they earn, I am just saying these are not ‘average’ wages in a city. they are more like average household wages. In Seattle teachers, firefighters and restaurant employees still have cars. Building a new building with 59 units and underground parking for only 16 vehicles in an neighborhood where it’s already almost impossible to park is just ridiculous. The developers need to rethink their design accommodate more parking. Am I the only one that thinks this project looks kind of cool? I love how they’ve utilized that triangle between E Madison and Union, and it looks like it will blend in nicely with the buildings around it. I’d personally rather see a building like this occupying that space than a lot that’s mostly surface parking. I’m sure the Cobra lounge will find a new space in no time. As for the Umbre Arms, not everything that’s somewhat old is worth preserving forever. I still can’t believe that there were people obstructing the new condo project at the old Broadway BofA site by arguing that that building should have been preserved. That kind of nonsense discredits the historic preservation movement, which does have an important role to play. I am not against redevelopment, however I am against bad design. Why does it seem all of the new buildings going up are BORING BLOCKS! YUCK!! !